I think everybody’s beekeeping depends on their own unique situation and desires. Beekeeping takes many different forms around the world and there is no one right way. It all depends on the circumstances of the person engaged in this activity. For me it has led to the use of top bar hives, both because of them being so inexpensive but also because they work well for Africanized bees. Here’s a glimpse of one of my top bar apiaries in Honduras. 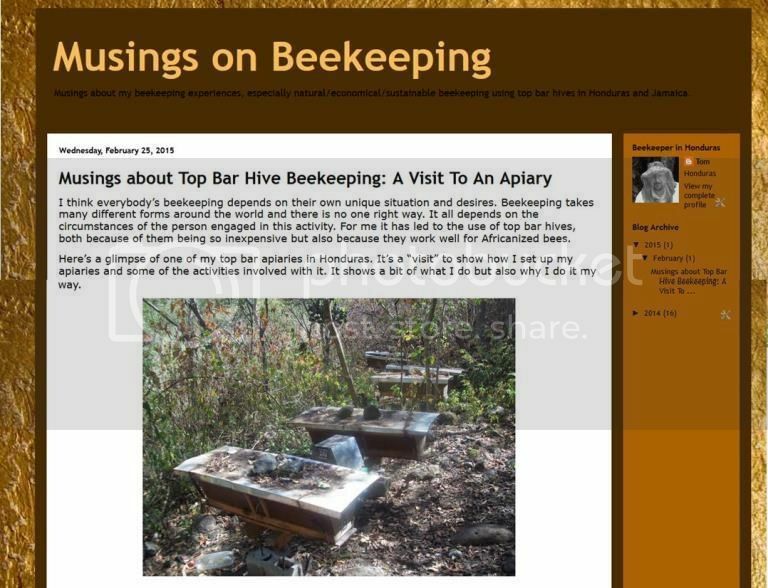 It’s a “visit” to show how I set up my apiaries and some of the activities involved with it. It shows a bit of what I do but also why I do it my way. I'm interested to know what the reality is with working with Africanized bees. Is there much of an added danger to beekeeping with them, or any other difference? Broadwell, your questions about Africanized bees give me another topic for a future blog entry. I’m sure that somewhere down the road I’ll be writing something. This post will be some initial thoughts for that blog! My bees are one hundred percent Africanized—no cross breading or selection to make them more docile. Queens can be bought in Honduras but they are expensive and it’s not done on a large scale. Breeding my own queens would be the better option, but I don’t have the time with my teaching job. I deal with what I get with the swarms. Over the years I`ve learned when I can do more intensive intervention in the hives and when I can`t. The time of the year definitely plays a big part in defensiveness. The rainy season generally seems to be the worse time for going into a hive. There is nothing flowering really so all the old field bees are at home and ready to get cranky. There were some times where the bees got so crazy that the best thing to do was simply close up the hive and leave. During the harvest season the bees’ temperament is a bit better, but I still need to get fully suited up especially if it is several hours of harvesting. Gloves and a veil are a must. I can sometimes get by wearing just a couple shirts instead of the overalls if I go into just a couple hives. The more hives you enter, the more ornery they get. I don’t do intensive management—no time really with my teaching job and Africanized bees don’t make it easy. The bees give me what they want and I`m grateful for it. It’s a nice extra income considering the little amount of time I invest in management. So this means the hives will swarm but I don’t let it bother me. I always see the positive in that the hive will have a nice young queen. And what better queen than one that was raised naturally by a strong hive. No mass production, grafting or shipping involved with it. As far as honey, they can make a good amount. Most of my boxes are over four feet long and the hives up in the coffee zone will fill that from one end to the other with comb. Half of it can be honey. For those interested (and those who speak Spanish), I have now posted this blog entry in my companion blog, Refexiones Sobre Apicultura. I hadn't seen your reply until now, so thank you for that. It doesn't sound as awful having africanized bees as I had imagined. I'll see what google translate makes out of your Spanish blog post too.